This week's episode, Making Friends and Influencing People, is pretty average... but with the improvements season 2 has made, that still would have put it amongst the best of season 1. We're still fine-tuning the formatting of these reviews for season 2 -- this week you'll find the recap up front and the Marvel arcana at the end. If you haven't caught this week's episode, spoilers are below... or you can catch up by watching on ABC's website or Hulu. And now, spoiler warning is in effect. Making Friends & Influencing People features what might be the best use yet of the particularly-kitschy version of "surprise plot-swerve" Agents of S.H.I.E.L.D. 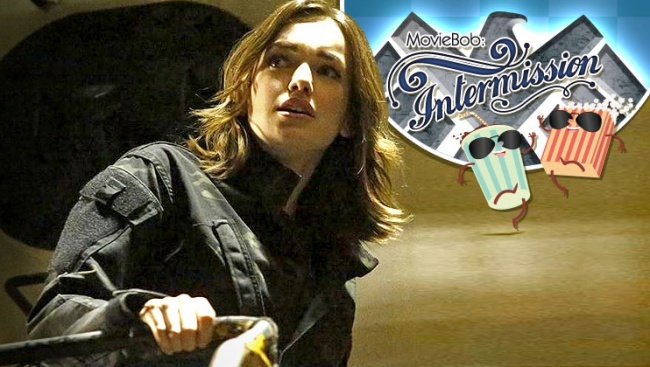 seems to regard as its preferred narrative trick: ex-agent Jemma Simmons (Elizabeth Henstridge) wakes up in her impossibly-cheery apartment, dolls up and bounds off to work at a Big City Office Building in a note-perfect recreation of the opening scene to any of a dozen "spunky young career-girl" series currently spread all over the airwaves -- complete with on-the-go breakfast sammich-munching, jaunty radio-ready pop song soundtrack and Henstridge continuing to make "ah-dow-a-ble" look so easy she's practically a Care Bear. ...or it would have been, had ABC's promotions for the episode not been spoiling it at every opportunity since last week. Oh, well. If you need a good metric for how palpably Agents of S.H.I.E.L.D. has improved in its new season, this third new episode would do nicely. Making Friends & Influencing People feels like a fairly average installment after the gangbusters scene-setting of the prior two -- the sort of episode that won't be recalled as particularly meaningful or memorable in retrospect beyond the longer-term plot elements it introduces/advances -- but would've stacked up with the very best of the uneven season 1. In many ways, it feels like an introduction to how single-mission episodes will be handled this season in terms of stakes, formula and character dynamics. The story: Simmons, undercover as a traitor gone to HYDRA (which is apparently poaching ex-agents of the officially-disbanded S.H.I.E.L.D. left and right) at the behest of Director Coulson, discovers that her employers are looking to bring ice-controlling young superhuman Donnie Gill (aka Blizzard, who got an origin-story in season 1 highlight Seeds) into the fold, so Team Coulson tries to get to him first. That's really about it -- a standard mission-episode that mostly exists to drop a few new details (see below) about where the characters stand and how HYDRA operates between the basic "capture Not-Iceman" beats. Still, the details do end up making the difference: Skye's training with May is less about combat skills and more about zen-like emotional suppression. Skye now wears a bracelet that monitors her heart-rate? Interesting. Agent Mack continues his (apparently) altruistic quest to form a bromance with Fitz? Endearing. Fitz discovers Ward's holding-cell and immediately decides to torture him with oxygen-deprivation? Unexpected. HYDRA boss Daniel Whitehall (aka The Kraken) has a brainwashing-machine (with a very Steranko-esque hypnotism-pattern as its visual component)? Intriguing. Skye calls Hunter "Trainspotting," he responds "I'm not Scottish!"? Funny! Not a classic, but a decent watch.